Steve Francis also entered the game relatively early, and immediately scored on a fast break and was fouled. I was pleased coach Rick Adelman saw the value that Francis could bring to the line-up after his outstanding game the night before in Phoenix. Although Yao Ming had two turnovers in the first quarter, he did his part on one play. From the top of the key, he set a pick for Mike James who took a jump shot, missed, but Yao was aggressive by coming in all the way fro the top of the key to crash the boards, grab the rebound in front of the basket and lay it in! Great hustle by Yao! In the second quarter, the Rocket reserves got them a little closer, with Bonzi Wells hitting a jumper, Francis hitting a three, and Mike James scoring on a layup from a McGrady dish to tie the game at 33-33. It didn’t hurt that the Warriors weren’t playing very strong defense. But with the amount of points they score, they can get away with not playing great D.
Yao then gave the Rockets their first lead at 35-33 when he hit a turnaround jumper from the right block. Simultaneously, the Rockets went “small” to keep up with the quicker Warriors, inserting Bonzi Wells, Luther Head, Kirk Snyder and Steve Francis into the game at the same time. It paid off as the Rockets’ bench played very well in that first half, outscoring the Warriors’ bench 26-6. But the whole Rockets team hit only 8-of-16 free throws in the first half. When you play against the Warriors, you need every point you can get. Those points could have helped since the Rockets quickly lapsed after taking the lead, and by the time halftime came, they were trailing 59-50, with Houston giving up 58% shooting to the Warriors. In the second half, the bottom fell out. The Rockets couldn’t keep up, and the Warriors cruised to a fairly easy victory without much of a threat, opening up a 20+ point leads in the fourth. They are just too quick, too good, and too balanced with Baron Davis (27 points), Monta Ellis (18 points), Stephen Jackson (19 points), and Al Harrington (18 points) killing them. No wonder they are the highest scoring team in the league. Meanwhile, Yao struggled against the smaller defenders guarding him like Harrington (who did well against Yao in Houston last year), making Yao turn the ball over 5 times, and forcing him to hit only 4-of-12 shots for 10 points. McGrady struggled just as much, making 5-of-14 shots for 11 points. The Rockets didn’t shoot all that poorly, hitting 45% of their shots. But as Adelman said after the game ended, he thought they weren’t mentally tough and started playing too much one-on-one basketball. That mental fragility also showed at the free throw line, where they missed 9-of-14 shots from the line in the second half to finish with a 56.7% overall average. That’s 13 points they gave away. Although Mike James was the leading scorer with 19 points, hitting 8-of-14 shots, he was 1-for-4 from three-point land. Everyone else was just as bad, too, including Rafer Alston going 1-of-4 from behind the arc. There’s no other team exciting to me as Golden State, more than Phoenix, Dallas, or anyone. So I’m not too upset about this loss because they will expose every weakness you have. If anything, the Rockets discovered how much they have to improve if they are going to get past them if they face them in the playoffs. This entry was posted on Friday, November 30th, 2007 at 1:16 am	and is filed under vs. Golden State. You can follow any responses to this entry through the RSS 2.0 feed. 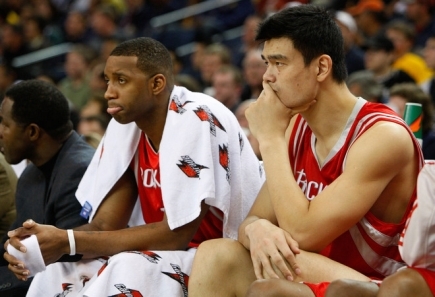 This is the worst game for Rocket starters, especially for Yao & McGrady. This team will not and could not pass the first round if without significant improvement. It’s not just a match up problem, it is the Rocket’s own problem. I noticed Yao is so inconsistent this year vs last year. ( I know it’s a new system) He is completely lost in game like today. McGrady seems even more inconsistent. I am thoroughly discouraged by what I saw today. I was there at Oracle Arena. I am not sure whether Adelman is the right choice. He is very slow at adapting and not knowing the player well. He may lost his touch as he aged. The rockets and Yao need to figure out how to handle being fronted. I don’t know why every team in the league doesn’t defend Yao this way. He always had bad games against teams that front him and the rockets just keep trying to force it in to him. The opposing teams have to slide someone over to cover the backside which should always leave someone open. The ball needs to move around to the open man (not through Yao). The warriors basically decided to take Yao out of the game and take their chances with Tracy and the rest of them. Adjustment….coaches should work harder to help the team. Good defense from the Golden State warriors. They can beat this team. They shut down Yao and tracy offensively. There must be a way to get them the ball when guys are fronting and double teaming. Tracy doesn’t look like he’s in a bad mood and doesn’t feel like playing. He looks tired. Yao’s shot wasn’t falling. His reflex is very slow….I don’t know if there’s a way to work on his reflexes. This team should be happpy to get into the playoffs the way they are playing. BTW why can’t they bring someone taller and faster to guard harrington and davis. Rafer is too small to guard davis….just like when he was guarding deron williams. It’s just wrong. Why not use landry to guard harrington…….he’s young and athletic. I don’t know…..sikma needs to do something. I have been reading the articles on this site for the past 5 years and I want to thank you for all your hard work. I don’t know how you do it in addition with your full-time job. I am very impressed with your writings and analysis. You write so well that I am really surprise that this is not your full-time job. I don’t ive in Houston. Thus, I don’t get many chances to watch Yao Ming plays. Your coverage on this site allows me to closely follow on Yao’s career. After each Rockets game, I always immediately log onto this site to view your analysis. I know that it takes a lot of dedication and sacrifices to run this site. So, thank you again!!! We want JVG or the GM himself to assume the duties of Head Coach of the Rockets. Full stop. I would like to echo what D says about you, your analysis and your dedication. I am really amazed at your effort running this site to bring this kind of information and support to Yao’s fans. Keep up the good work and thanks a million for your dedication! Wow, you definitely called that one. When I initially read your prediction on the night before the game, I thought it was a little premature and that the Rockets would come out against Golden State and prove you wrong.